Carey Lohrenz on "Lessons in Leadership"
As the first female F-14 Fighter Pilot in the U.S. Navy, Carey Lohrenz knows what it takes to win in one of the highest-pressure, extreme environments imaginable. Based on her book, “Fearless Leadership,” Lohrenz shares the fundamentals that helped her win in the cockpit at Mach 2, and can help your team win in business. A limited number of autographed, complimentary copies of “Fearless Leadership” will be available to Summit attendees. Lohrenz is a dynamic communicator with an incredible story. As the first female F-14 Tomcat pilot, she was a pioneer in military aviation. Having flown missions worldwide as a combat, mission-ready Navy pilot, she is used to working in fast moving, dynamic environments where inconsistent execution can generate catastrophic results. When she left the Navy in 1999, Lohrenz began a career as a leadership expert and professional speaker and has appeared on CNN, MSNBC, NBC, CBS, ABC and NPR. In her motivating and engaging keynote presentation, she will share her fascinating experiences operating in the challenging environment of an aircraft carrier. She is uniquely qualified in the fundamentals of winning under pressure, reducing errors and overcoming obstacles. Her mastery of these fundamentals can help your team triumph in this high-risk, time crunched world. 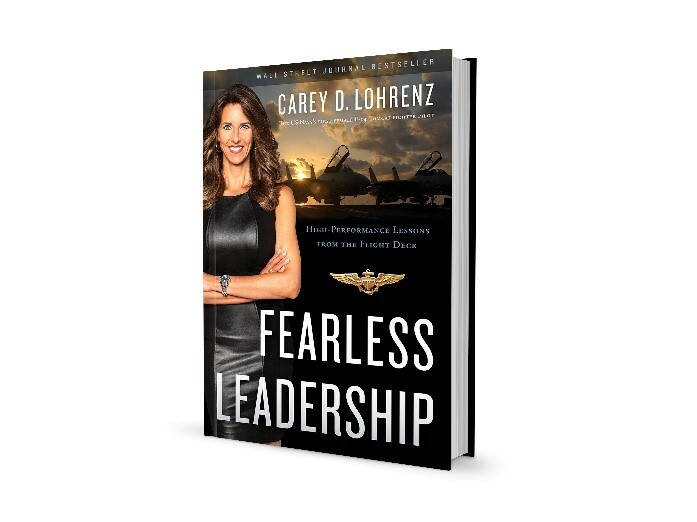 Carey Lohrenz is the author of “Fearless Leadership: High-Performance Lessons from the Flight Deck.” She resides in Excelsior, MN, and is currently working on her Master’s in Business Administration in Strategic Leadership.